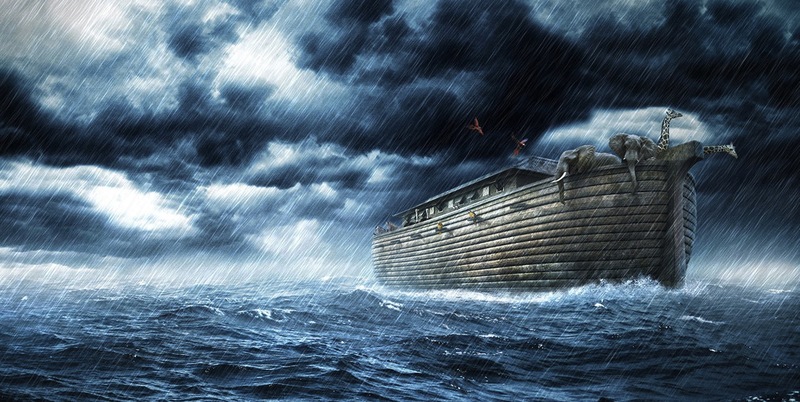 It has been calculated that Noah was 480 years old when God commanded him to build the Ark, and around 600 when the flood came. The Ark was huge – around the same size as the SS Canberra, a little longer than a football pitch and about the same width. (see here). Imagine you are on Noah’s construction team, about halfway through the build. It’s a hot day, you’re working hard, and getting a lot of grief from passers-by who ridicule your efforts. ‘When’s high tide Noah ? !’ ‘You’ve been working for 60 years and you haven’t got your boat half built !’ Hard to take isn’t it ? But ‘faith is the substance of things hoped for, the evidence of things not seen’. (Heb 11.1). Faith sees through the moment to the eternal. In Noah’s case, that involved 120 years of hard, patient labour, under the scorn of a disdainful and unbelieving world. God’s timescales are different to our own. Jesus used Noah as an example for the end times. He said ‘just as it happened in the days of Noah, so it will be also in the days of the Son of Man’. (Luke 17.26). Life would seem to carry on as normal, but His last-days disciples would be working to another drumbeat. The ‘Ark’ didn’t take Noah and his family out of trouble – it carried them through it, for a sustained period. Jesus’ warning is pertinent to us. As an ‘end-time survivor’ we must prepare, and it is certain we will be ridiculed for our preparations, and that ridicule will go on for a long time – many years. I want to encourage you to ask the Lord to guide you for specific instructions in building your ‘Ark’ – not a wooden boat, but a character, lifestyle and ministry that will faithfully endure to carry you through trouble. If you ask, He will reveal His Masterplan, personally tailored for you. Make sure you follow its design: every piece of wood; every fastener; all the provisions; and who you are responsible for protecting and providing for. The details are vital, as failure to install an important component (such as prayer or Bible study) may cost you your life. When the flood came, it came quickly, overwhelmingly, and from every direction. Several Middle Eastern traditions, not just the Old Testament, but from Egypt and Babylon describe a tremendous flood affecting that part of the world. It happened. There was no mercy, no escape for those outside the Ark. Undoubtedly there were those outside the Ark who ‘believed in God’, but were caught up in the world, ignoring His prophetic word. They perished too. Don’t think for a minute that the Master is delaying. End-Time Survivor describes how Jesus decides when to open the 7 Seals of Revelation that dictate the end-time schedule. He is the overseer of the trouble, and we must endure it. The majority of today’s Church in the West is busy partying, thinking Jesus will come any moment, and they will escape. They are in for a major shock. This view misinterprets the clear warnings Jesus gave us. Don’t be fooled. Prepare. The water is rising fast. Ask the Maker for His instructions, and get building.